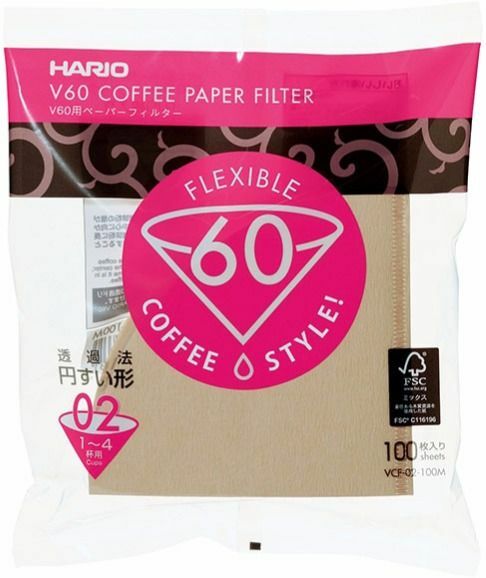 Original Hario V60 filter papers for brewing pour over coffee with a Hario V60 dripper. Made in Japan of natural unbleached paper. This filter is of size 02 (for 2 cup drippers). Brewing with the V60 paper filters could not be any easier. They are also very easy to dispose. Insert the cone filter into a Hario 02 size dripper and add water before the brewing process begins to ensure that there is no paper taste in your tasty coffee. Then, add the coffee grounds and pour hot water. 2 to 3 minutes later you will be enjoying the best, sediment-free coffee. my order was dispatched the same day! super fast!!! Korkealaatuinen suodatinpussi keittimelleni. Paperi tuntuu silkkiseltä sisäpinnalta. Juuri sopiva. Toimitus olisi voinut olla nopeampikin.